It is definitely an older prooerty. Overall, seemed mostly clean but the old carpets made it seem dirty. Some walls could use touch ups and paint. The continental breakfast was pleasant. The staff friendly and helpful. Where can I find hotels in Meadow Lake that are near tourist attractions? For those travelers who are chasing a room near Meadow Lake, there are a few places from which to choose. Within easy driving distance of the center of town, there are 3 Expedia-listed hotels. The Travelodge Meadow Lake is nearest to the heart of Meadow Lake and the only option within a short drive. 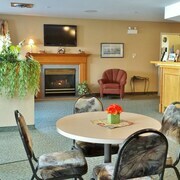 The Woodland Inn Meadow Lake is located 4 kilometres (2 miles) away from the heart of Meadow Lake. 4 kilometres (2 miles) away is the Wakiki Motel & Lounge which is an alternative. If you are arriving or departing through John G. Diefenbaker International Airport, you may choose to book some accommodation at The James Hotel, or Delta Hotels by Marriott Bessborough, which are both a short ride away. Are there hotels in other cities near Meadow Lake? 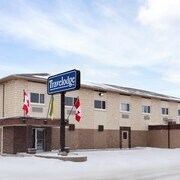 What other types of accommodations are available in Meadow Lake? Explore Meadow Lake with Expedia.ca’s Travel Guides to find the best flights, cars, holiday packages and more!